Cecilia Bradford was born in 1792, to Henry and Elizabeth Payne Blakemore Bradford. The Bradfords lived near Drake's Creek on the Davidson-Sumner County line. On September 6, 1813, in Sumner County, Cecilia married William Carroll. They would live in Nashville where Carroll operated a nail factory and store. Carroll enlisted with Andrew Jackson and fought in the Creek Wars and at the Battle of New Orleans. In 1821, Carroll was elected Governor of Tennessee. He died in 1844 and was buried at City Cemetery. A year of his death the State Legislature passed a Resolution to erect a handsome monument over his grave. To view Governor Carroll's monument, see Carroll, William ID # 120016. When Cecilia died in 1848, she was not buried on the lot with her husband. She was buried on a nearby lot purchased by Mrs. Eleanora Carroll in 1843. On this lot, Cecilia's young granddaughter Elizabeth Jane Carroll had been buried in 1845. The tombstone for the little granddaughter is still standing. The tombstone for Mrs. Carroll had been lost to weather and time by the time of the first survey of Sections, Lots and Tombstone Inscriptions in 1908. In 2014, Susan Thomas, State Regent of the Tennessee Society DAR, contacted the Nashville City Cemetery Association and Metro Historical Commission, about the possibility of placement of a new marker on the grave of Mrs. Carroll. This plan was approved. 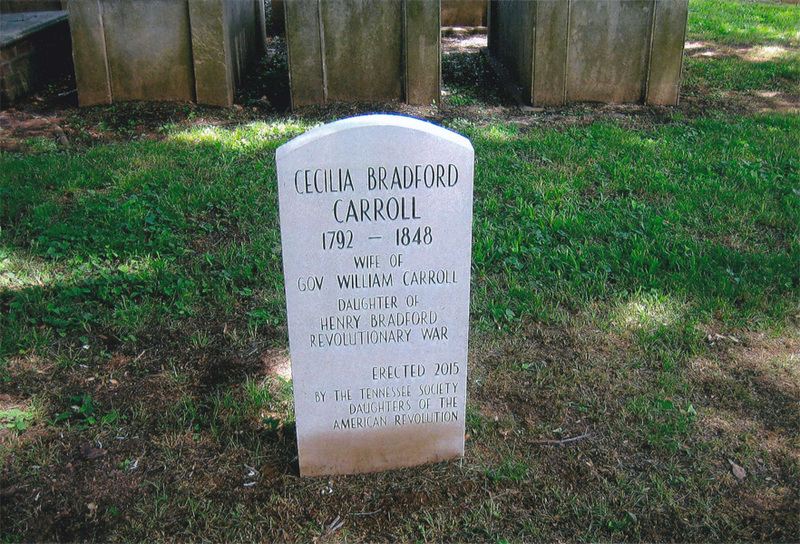 On April 12, 2015, Tennessee Society of Daughters of the American Revolution dedicated a replacement tombstone for Cecilia Bradford Carroll. The ceremony was presided over by State Regent Susan Thomas and State Chaplain Dianna Callaway. The memorial wreath was placed by members of the Cecilia Bradford Carroll DAR Chapter, with Tabitha Myers, Organizing Regent. Albert Austin, a direct descendant of Cecilia and William Carroll, and his wife Wendy were in attendance at the ceremony.